With white icing and round tip size #5 do lace work on sides of cake. Lace work is done by making squiggly lines over the surface you are covering. Still using white icing and star tip size #18 do the shell border around the top and bottom edge of the sides of the cake as shown in the picture. 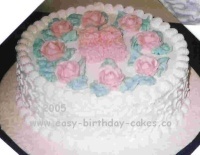 Make the booties in the center of the cake using pink or blue icing and star tip #18. Make two small foot shapes filling them in. Next put another layer on top of the first. At the heel end, make a circle to represent the ankle cuff. With round tip size #5, make a bow at the front of the ankle cuff. Next make the roses with pink icing and place around the booties. Finally, make the leaves with green icing and leaf tip size #352.